I took this shot a few weeks ago when my tomato harvest was peaking. Ahh the good ‘ol days. A whole bunch of heirloom tomatoes! The big orange ones in the middle are Goldie – and they are beauties. I’m actually still getting a few of those off the vine. They’re a later variety. The big pinky one just above those is a Brandywine. 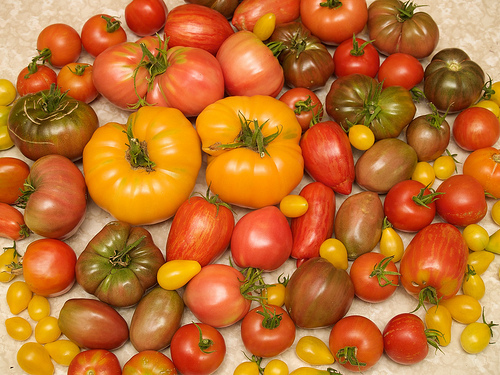 The greenish ones are Black Sea Man, then there are Red Striped Romans, Yellow Pear, Purple Russians (another roma variety), Tigerella, Oxheart, Harbinger, Money Maker, Stupice, and I think a couple of Deuzbas. All of these babies found their way into either salsa, or toasted tomato sandwiches. YUM!